In April, Turkish President Recep Tayyip Erdoğan called for snap elections expecting to solidify his rule under new constitutional powers. Yet with less than two weeks to go until the June 24 vote, he does not have majority support from Turkish voters. 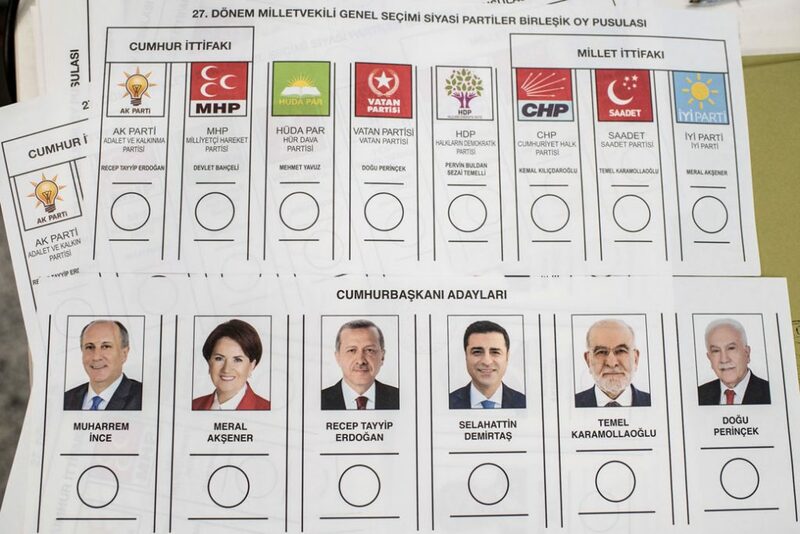 Likewise, Erdoğan’s Justice and Development Party (AKP) and party allies remain short of majority control ahead of the parliamentary elections scheduled for the same day. These findings are based on a comprehensive survey conducted jointly by the Center for American Progress and Metropoll, a respected Turkish survey research firm with a long history in Turkish politics. The study consisted of 2,534 face-to-face interviews with Turks using stratified sampling and weighting methods in 28 provinces based on 26 regions of Turkey’s Nomenclature of Territorial Units for Statistics (NUTS) 2 system. The survey was conducted May 24 to June 4, 2018, and the total results have a margin error of 1.95 percent at the 95 percent level of confidence. A slide deck presenting the data and major findings can be found here. In a potential runoff election between the current top two candidates, President Erdoğan leads Republican People’s Party (CHP) candidate Muharrem İnce by a 48 percent to 36 percent margin, with about 7 percent undecided. 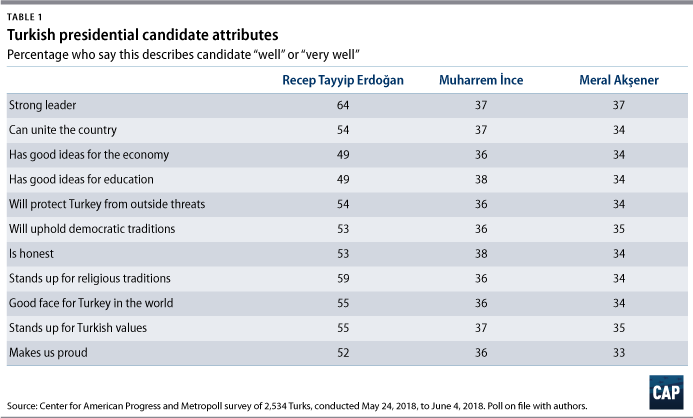 The survey also presented respondents with a battery of personal and political characteristics and asked them whether each one described President Erdoğan “well” or “not well,” and then asked the same set of items for Muharrem İnce for half the sample and for Meral Akşener in the other half of the sample. Erdoğan received higher rankings on each of the items than either of his closest challengers in the presidential race. President Erdoğan’s party coalition—comprised of the ruling AKP he helped found and the rump of the now divided right-wing nationalist MHP—faces off against a broad opposition coalition that has brought together the secularist main-opposition CHP; the new center-right İYİ Party (Good Party) founded by MHP dissident Meral Akşener; and several smaller parties including the Islamist Saadet (Felicity) Party. The AKP-MHP electoral alliance* is currently in danger of falling short of a parliamentary majority, but much depends on the exact geographic distribution of the vote, which is very difficult to predict. The new opposition bloc receives one-third of the parliamentary vote. And crucially, the majority-Kurdish, left-wing Peoples’ Democratic Party (HDP) is poised just above the 10 percent electoral threshold. As in past elections, the fate of the HDP will once again determine the Turkish parliament’s makeup, with the AKP standing to benefit should HDP fall below the threshold. Forty-three percent of Turks say their family’s living standards have worsened in the past year versus 27 percent who say they have improved over this time. Fifty-three percent of AKP voters feel their family’s living standards have improved compared with 80 percent of CHP voters, 80 percent of HDP voters, and 51 percent of MHP voters who feel their living standards have worsened. The official Turkish annual inflation rate surged to 12.2 percent in May, when the poll was conducted, exacerbating long-standing concerns about the rising price of basic goods. The Turkish Central Bank stepped in to raise interest rates on May 23, the day before the poll went in the field, halting the slide of the lira, which had lost 20 percent of its value against the dollar since the start of 2018. With official unemployment at 10.9 percent—and possibly much higher in reality—and youth unemployment at 19.9 percent, job creation will certainly be a major issue for Turkish voters. Asked to choose which of three options should be the most important focus of government economic policy, 65 percent of Turks say “creating more jobs” should be the top focus with 23 percent saying “increasing wages” and 11 percent saying “reducing household costs” should be top economic priorities. Fifty percent of Turks report that they do not want Turkey to be a part of the European Union (EU) versus 49 percent who do want Turkey in the EU. Strikingly, 78 percent of Turks believe that European governments do not want Turkey to be a member of the EU, compared with only 20 percent who feel these governments do want Turkey in the EU. Fifty-four percent of Turks characterize the current relationship between the EU and Turkey as “a poor relationship” with 38 percent believing it is “an okay relationship” and only 8 percent feeling it is “a strong relationship.” Not surprisingly, Turks overwhelmingly blame the EU and European national governments for any tensions or distrust between Turkey and Europe: Sixty-seven percent blame the EU and its governments versus 30 percent who blame Turkey and Erdoğan. Likewise, presented with the idea that some EU governments are considering withdrawing funds or possibly ending Turkey’s EU accession bid in response to perceived threats to democratic freedoms and the rule of law in Turkey under Erdoğan, 75 percent of Turks say that these actions would be unjustified compared with 22 percent who feel they would be justified. Despite the perceptions of a negative relationship with Europe, nearly two-thirds of Turks (65 percent) still say that they would like for themselves or for their children to be able to travel freely, study, or work in the EU if given the chance. By a 40 percent to 3 percent margin, Turks say they trust Russia more than they trust the United States, with 50 percent saying that they don’t trust either one. At the same time there are some conflicting attitudes among Turks on security matters. For example, a majority of Turks (55 percent) want Turkey to remain in NATO but at the same time 57 percent of Turks want the country to build a lasting alliance with Russia. With nearly 3.6 million registered Syrian refugees residing in Turkey—and many building long-term lives in the host country—Turks are extremely focused on the refugee issue and strongly support policies to return the Syrians to Syria. Only 48 percent of Turks believe that the country’s recent policies toward Syria have been successful compared with 50 percent who feel they have not been successful. Survey respondents were also asked what Turkey’s top two policy priorities should be in Syria. A majority, 57 percent, say “resettling Syrian refugees from Turkey to Syria” should be one of the two top policy priorities, far outpacing “ensuring Syria’s territorial integrity” in second place. These results show that Turks remain deeply divided and uncertain about the political leadership of Turkey, the state of the national economy, and the country’s posture and position vis-a-vis the West and Russia. With just a short amount of time to go until the election, President Erdoğan and his party hold a clear if not yet decisive position ahead of the voting. The opposition parties and candidates are currently not in a position to win, but they could hold the ruling party and president to less than majority power and force a runoff or complicated parliamentary relationships. If the opposition prevents the AKP-MHP alliance from winning an outright majority of parliamentary seats and forces President Erdoğan to a second-round runoff on July 8, Turkish politics will be thrown into profound uncertainty. During that campaign, the opposition would almost certainly argue that only their candidate could work smoothly with the “opposition-majority” parliament, while President Erdoğan would be fighting for the survival of his 15-year rule. John Halpin is a senior fellow at the Center for American Progress. Max Hoffman is the associate director of National Security and International Policy at the Center. Alan Makovsky is a senior fellow at the Center. Michael Werz is a senior fellow at the Center. *Authors’ note: Although parties derive certain electoral benefits from membership in an alliance, voters will vote only for one party, not for an alliance. As there is no guarantee that the coalitions will hold together after the election, each party is naturally focused on maximizing its own vote. The Center for American Progress would like to thank Stiftung Mercator for its continued support of its research on Turkey, Europe, and their relationships with the world. The Center is also grateful to Metropoll Strategic and Social Research Center for its excellent conduct of the nationwide poll.